With over 45 years in Manatee County and a decade in the real estate industry, Lynne Callahan is a true expert when it comes to the variety of properties and lifestyle options in this special region of Florida’s Gulf Coast. 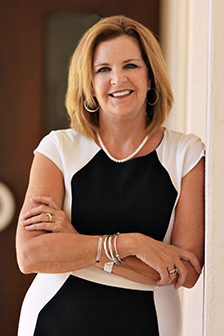 Lynne’s extensive marketing and customer service background has served her well throughout her years in real estate, whether she is connecting with potential buyers at an open hous... more.e or ensuring her seller’s property is staged to perfection. From the very first meeting, Lynne establishes an open line of communication with her customers to ensure they are kept up to speed at every stage of the process. Her hands on approach is appreciated by buyers and sellers alike as they navigate one of life’s most significant decisions, and as a result she has built a loyal client base who confidently refer her to their family and friends. Bradenton is home to Lynne, her husband Carl, and son Connor. Committed to making a difference in the community she loves so much, Lynne currently serves on the Leadership Manatee Alumni Association Board, is a sustaining member of Junior League of Manatee County, and belongs to the Manatee County Chamber. ...less. Lynne listened to what my daughter was looking for in a home and worked with us tirelessly until we found the correct house for her. When it came to closing there was a hiccup which Lynne stepped into resolve with a solution that both parties found acceptable. Lynne so impressed us that we have repeadtedly recommended her to friends. Lynne Callahan @ Michael Saunders helped me buy and sell my home in Bradenton. Both transactions can be confusing and stressful. Lynne was always available to help me through. I relied on her expertise while at the same time she also calmed my anxiety. I truly can't say enough to express my gratitude. I would highly recommend Lynne. I used her services for both selling my home and buying a new one. She is one of the most professional people I have ever had the privilege of working with. Service is the name of her game!! It does not matter how often you contact her,how often you contact her at odd hours, how big or how minor your questions are , she answers you with a smile. She takes care of everything to make the sale or the purchase go as smooth as possible. With Lynne's advice on staging and pricing of my home it was sold in 2 weeks. When making a purchase Lynne was a real negotiator on my behalf. Lynne knows the market. Lynne made the sale and the purchase simply and painless.